The UK tabloid gets a redesign courtesy of one of Britain's most famous artists. For one day only, UK newspaper, The Sun, will get a new logo design courtesy of one of the world's most famous artists. Taking the familiar red masthead and giving it a redesign is David Hockney, an artist famed for his bold use of colour. 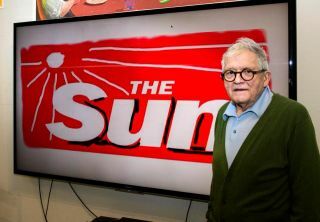 Given The Sun's vibrant red logo, it makes sense that Hockney was on hand to give the design a revamp. Available to buy today on the front of every printed copy of The Sun, the new logo features a beaming sun and squiggly shadows beneath the lettering.